Posted 4th May 2017 & filed under News. “If I can keep Syria’s children healthy, then I’ll be happy” concluded Masud*, a doctor who participated in a PCI training workshop for the World Health Organisation (WHO) in Amman last month. We were chatting over coffee during a short break in a busy programme about Non-Communicable Disease (NCD) management, using ‘Emergency NCD Kits’ that the WHO is about to launch in pilot clinics in southern Syria. Masud fled Syria 2 years ago with his young family and now works passionately from the safety of Amman to support many friends and colleagues who remain on the other side of the border. Frequent SMS alerts on his phone announced growing numbers of measles cases, heralding the start of an epidemic – just one consequence of a health infrastructure broken by war, and another challenge for under-resourced health teams to deal with. Masud starts to arrange an emergency vaccination campaign whilst he continues to participate in the NCD training. Such is the dedication of the people PCI has the privilege to work with. Another consequence of the ongoing conflict is the lack of facilities available to treat people with chronic diseases such as asthma, diabetes, hypertension and ischaemic heart disease, which are now responsible for at least 36% of all deaths. Many clinics have just a handful of medicines and are unable to check even the most basic blood tests. Essential medicines supplied the acute emergency phase of a conflict do not currently include those used to manage and treat NCDs. Recognising this, the WHO has designed an ‘Emergency NCD Kit’ to provide basic resources (drugs, instruments, tests) for the management of these conditions until reliable procurement becomes possible. PCI was invited to Jordan following our successful collaboration in September to support clinics in Northern Syria from across the border in Gazientep (Turkey). 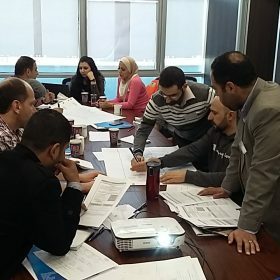 Our workshop with staff based in Amman focussed on how health teams in the Syrian clinics might use the Kits to provide effective, evidence-based care, drawing on PCI’s Field Guides, which we have aligned to WHO guidance, and which will be included in the WHO Kit’s as a resource. Teaching clinical skills is challenging at the best of times, but how do you do it WELL remotely? That’s the question we tackled throughout the week with the Amman team, as they now have the task of preparing their Syrian counterparts for the imminent arrival of the Kits. The border with Jordan closed in 2015 and is unlikely to reopen soon, so all support will require technology and a bit of imagination! We laughed as we gave and received interactive guidance about “examining the diabetic foot” and “how to use inhalers” from people in the next room, but effective application of this will have some seriously positive implications for patients. As we write, the NCD Kit is being assembled in a distant warehouse, the health staff at the pilot clinics in Syria are preparing to receive it, and PCI has been invited to provide distance mentoring to health teams supporting its roll-out. We’re recruiting – could you be our next Partnerships Manager?